It is clear that the Age of Oil is winding down. Worldwide, the rate of discovery of new oil reserves peaked in the 1960s and in the US our peak rate of oil discovery occurred in the early 1930s. In recent years the world has used about three barrels of oil for every barrel of new oil reserves discovered. Thus we are living largely on past oil discoveries. There is still a lot of oil in the world, and we will still be using a lot of oil decades from now. But it will be increasingly expensive both economically and environmentally to find, produce and refine that oil. Thus we need to identify and develop realistic petroleum alternatives. The question is therefore: What are possible alternatives to oil? What criteria should guide us as we choose between possible alternatives? I suggest the following tentative set of metrics for choosing between our various alternatives to oil and I welcome discussion around this topic. Metric #1: Scale Humankind currently uses about 450 exajoules (EJ) of energy per year and will require even more energy in the future. Petroleum provides about one third of global primary energy. As a starting point for discussion, let us require that any petroleum alternative be capable of providing roughly 10% of that currently provided by petroleum, or 15 EJ/year, if we are to take it seriously. Metric #2: Cost of the fuel It seems highly unlikely that future transportation fuels will ever be as inexpensive as the fuels provided by oil at $20 per barrel. However, we cannot pay an unlimited amount for transportation fuels either. As a starting point for discussion, let us require that any oil replacement at technological maturity be capable of providing fuels at a cost equivalent to oil at about $100 per barrel, roughly the current level. Metric #3: Capital cost of the fuel production system Many decades and trillions of dollars will be required to make the transition to petroleum alternatives. Thus lower capital cost systems providing the same energy output are obviously very highly favored as they will require less current wealth (foregone current consumption) invested to ensure future access to energy. Systems that use or leverage existing capital assets for raw material production, fuel processing and distribution are thus highly advantaged. Metric #4: Energy Return on Energy Invested Society functions on the surplus energy (called “net energy”) provided by its fuel system that is in excess of the energy required to build, maintain and operate the fuel system. This simple physical fact is often expressed as a ratio called the “energy return on energy invested” or EROI. EROI is equal to the energy provided to society by the fuel production system divided by the energy input from society required to build and operate the fuel production system. I suggest a minimum EROI ought to be greater than 6:1, that is, 5 GJ of energy “surplus” to society for every 1 GJ used in the fuel production and distribution system. Metric #5: Sustainability There seem to be four primary aspects of sustainability with regard to petroleum alternatives: economic viability (discussed above), environmental impacts, social impacts and renewability. I believe renewability is the key sustainability criterion. The next energy systems we put in place should, in principle, last indefinitely, not just the century or two that oil was able to serve humankind’s needs. Renewability is relatively easy to gauge whereas environmental impacts are less easy to gauge – such as greenhouse gas (GHG) emissions, water use and water quality effects, biodiversity, land use – and will probably differ for different fuels, different stakeholders and different situations. What are possible alternatives to oil? What criteria should guide us as we choose between possible alternatives? I find this to be one of the most pressing issues we face, partially because the changes we need are so dramatic. It seems that a sub-text of Prof. Dale’s questions is that a simple substitute of petroleum with something like liquid biofuels may be problematic, at least as currently planned (conflict with Metrics #1 and #4, at least). Going out on a limb, even second-generation cellulosic biofuels may not be a panacea if the biology and chemistry of processing does not work out to be as simple as originally envisioned. In addition, we are increasingly mixing energy, food and water systems worldwide, potentially causing conflicts with Metric #5. Personally, I think the the long-term solution if we are to choose sustainability will be electrification of the transport system using renewable energy sources, integrated with a more intelligent grid that must be built in any case. Even this option might violate Metric #6 (not listed): Timing – how long will it take to get to a system that meets Metrics #1-5. I agree that we need as much sustainable electricity as we can to support mobility, but it is simply not possible for electricity to meet all the work needs that liquid fuels currently support nor all mobility services. Off-road mobile work platforms such as bulldozers, plows and grain combines must be serviced by liquid fuels. Long haul trucking, ocean shipping and jet aircraft also require liquid fuels. We could probably convert much short haul train traffic to electricity, but electrifying our continental rail system would be vastly expensive. So most rail transport will also continue to be met by liquid fuels. I don’t believe that liquid fuels need to do in the future everything they have done in the past, but there are some non-substitutable applications for which we will require liquid fuels indefinitely. To ignore this fact seems to me to ignore reality. I’m not quite sure the Age of Oil is winding down just yet, considering the recent shale oil boom and dramatic vehicle fuel economy improvements in the pipeline. In addition, oil producers have barely begun to look outside the US for viable shale deposits. But assuming the predicate is correct for purposes of this discussion, the suggested list of criteria is a good start, with one big hole, IMO. We cannot look at fuel alternatives as if we are starting from scratch, because we are not: we have a huge existing infrastructure to consider. Ethanol shows us that pipeline compatibility is not critical for new fuel introduction/penetration, but it sure would help (less costly, lower energy use, lower risk). Few retailers are willing to assume the expense and risk of selling one or more new fuels to a tiny and uncertain market, and what consumer is interested in paying more for a vehicle to use a fuel that may not be available to them at any price? This is the classic chicken and egg question, illustrated very well by our experience with E85 and CNG. After several decades of priming the pump (so to speak) with FFVs on the one hand and captive CNG fleets on the other, retail consumers and fuel providers still have not bought in to either CNG or E85 in the broader market. Now the talk is all about hybrids, plug in electric and maybe fuel cell vehicles. Fuel and vehicle diversity–touted by some–really just complicates vehicle and fuel matching, compared to the simpler, less diverse market we have now. Fuels that are or can be made compatible with existing hardware avoid all these issues. So, for me, infrastructure compatibility should be on the list. Thank you for this comment. I do agree that we need to use as much of the existing fuel infrastructure as possible, and that fact is included in the last sentence of Metric 3. Thank you for the reaction to my comment, Dr. Dale, but it appears you and I differ in calling the existing fleet part of the fuel infrastructure. And I note that the Metric 3 language explicitly focuses on the fuel supply infrastructure. Fuel compatibility with the delivery system (e.g., pipelines) has little relevance to compatibility with today’s high technology vehicles. Indeed, this is why automakers expend significant effort advocating for fuels–existing and new–of a particular quality. Fuels that are incompatible with the existing fleet will always be faced with the classic fuel-vehicle matching conundrum, even if all your criteria are otherwise met. This factor deserves explicit consideration. Metric #3: Capital cost of the fuel production system and timing Many decades and trillions of dollars will be required to make the transition to petroleum alternatives. Thus lower capital cost systems providing the same energy output are obviously very highly favored as they will require less current wealth (foregone current consumption) invested to ensure future access to energy. It is important to identify alternatives to petroleum with the greatest chance of more rapid adoption. Systems that use or leverage existing capital assets for raw material production, fuel processing, distribution and final use are therefore advantaged. I do agree that coordination between fuel producers and fuel users is important, but we may not have the same options in the future that we have had in the past because of constrained energy supplies and capital. Given a particular fuel, sometimes the auto manufacturers can learn to use it well…even if they would not have chosen to use it in the first place. The evidence gathering around the value of high level (30% or so) ethanol blends to provide high octane without ethanol’s mileage penalty is a case in point. Dr. Dale, I think your revised Metric 3 is much improved over the original, and it nicely covers the issue I raised. Thank you for reconsidering it. Ethanol is a great case study for looking at what it takes to move to an alternative fuel (liquid or otherwise). It has had all the policy advantages possible for more than 4 decades, yet it took a government mandate (RFS) to get it to saturate the gasoline market, and in 2014, it’s future growth remains to be seen. Interestingly, a growing number of people are now concluding it was a policy mistake to push ethanol so hard, considering emerging concerns about impacts on climate change, food supply, land cost and land conservation, not to mention fuel economy. This case shows it’s a slow and uncertain process under the best of circumstances, and then we learn something new that changes the picture. I’m not sure how to end this except to note there are many layers and twists and turns when evaluating fuels. Good luck with your very important inquiry. Cars have about 30,000 parts, and the US fleet contains about 250,000 vehicles of different designs and ages. It seems quite simplistic to say one only needs to tweak the ECU and a vehicle can suddenly use higher ethanol, methanol or something else. You can certainly put corrosive E85 or M85 in a reprogrammed non-FFV if you like, and good luck to you, but I prefer to follow the builder’s advice on a vehicle’s appropriate fuel usage. Even assuming you are correct that one only needs to reprogram the ECU, if I were an automaker, I would have the willies thinking about warranty impacts, legal impacts and risk to the customer relationship from reprogramming on a wholesale basis. And at the end of the day, the alternative fuel still might not be viable. I will give you that ethanol has an important octane benefit, and this is one reason automakers are indeed interested in it. I’ve heard some companies are actively looking for an “optimum” ethanol level for redesigned systems that will balance out the BTU loss, and E30 has been reported as one such possible level. More generally, however, those companies stating a willingness to design for E30 or any new fuel have asked only that their new, differently designed vehicles will have access to the fuel for which they were designed and that the existing fleet will be protected from misfueling. These reasonable requests show automakers themselves treat cars as hard wired. It doesn’t matter whether they do so for non-technical reasons, since in my experience, there are also plenty of technical reasons to be found. My apologies, indeed my statement was over simplistic . You are right that cars are incredibly sophisticated machines which a large number of parts. However, inside the cars of interest are parts in the fuel system. And of those the interest further focuses on the fuel pump, fittings, O-rings, seals, fuel lines and the fuel injection system. With the exception of the fuel pump which in retail price is quite expensive, all other parts are relatively cheap. When it comes to vehicles the main focus is on high mileage vehicles that are also low MPG. Most miles are made by vehicles that are less than 12 years old. So the focus is on low MPG vehicles that are less than 12 years old. In other words pick up trucks and SUVs model years MY2003 and above. Luckily a few models dominate this category such as the Ford F150 and the GM Silverado. Also luckily those models have both FFVs and non-FFVs models (or else there are cars with the same ECU and engines that are FFVs). So it is relatively easy to simply copy parts over as well as ECU software. (Actually most already have the same parts and in many cases even the FFV software enabled but are simply not labeled as FFV). Last, engine tuning and ECU tuning are commonplace in the car enthusiasts world. There is a multi-hundred million dollar industry for ECU modifications. Millions of cars and trucks run on modified ECU programming. It is fair to say that if you see a pickup truck that is toeing anything, or that is lifted, or lowered, there is a very high chance that it was also not running OEM stock ECU software. Similarly, the road racers and performance enthusiasts routinely modify stock ECU software. I hope this clears my statement a bit . I think the criteria in the article is correct, but I believe the questions are rather moot. Any country must prepare itself for changes in access to and costs of energy. Energy is a critical security issue for any country. The United States has taken a rationale approach to liquid fuels atop of energy efficiency standards for vehicles (President Obama just announced the intention to increase fuel standards for heavy duty trucks). Aside from electric vehicles, the US has promoted a series of alternatives utilizing two pathways. The first path is using alternative liquids that either can be blended with gasoline (such as ethanol) or alternative liquid fuels that mimic gasoline or diesel (called “drop in” fuels). These drop in fuels require no engine modification and act identically with the fuel they are replacing. The second path is to have new fuels such as natural gas, hydrogen, unique biofuels (such as butanol or methanol), or electric vehicles. Further efforts are encouraging multi-fueled engines allowing the driver to make any fuel choice. This should be the goal giving vehicle owners as many options as possible — low cost, great performance, low-emissions, US-made — or any other attribute the market will bear. The role of the government should be to allow mechanisms for maximum choice and maximum competition. I thank Mr. Sklar for emphasizing the importance of giving the consumer energy choices. I agree that fuel choice is crucial to proper market function. Unfortunately, the existing energy industry seems to be dead set against consumer choice, particularly the oil companies. The ongoing debate on the Renewable Fuel Standard is a case in point. My purpose in proposing a set of metrics was to elicit some comments to see how widely my views of the key metrics might be shared. I am not proposing any particular policy application of these or other metrics. I just want to see what people think of these metrics and allow them to suggest refinements to them and/or additional metrics. I don’t agree with this idea. National concerns are one thing, To assure reliable electricity to a nation’s populations requires a myriad of decisions, investments and regulatory negotiations. No simple chart is of much use. Mr. Rossin, I don’t understand your comment. Would you like to clarify? I was not thinking primarily of electricity when I developed these metrics, but rather about liquid fuels. This is not anything I follow but thought you all who do might not want to miss this info from NREL It says to me that we aren’t there yet. There are many developing alternative liquid fuels with respect to conventional oil which appear promising, but hard work lies ahead. Nevertheless, appropriate metrics represent an astute question at this time and indicate that we are getting serious about this subject. I have tried to make a few meaningful comments about each metric proposed. Metric #1: Scale. Professor Dale’s figures on global petroleum consumption works out to 25 billion barrels of oil per year. This is a conservative figure that excludes related liquid fuels including natural gas liquids, lease condensates, shale and tar sand oil, and non-petroleum fuels such as ethanol. The total global production of “liquid fuels” is over 30 billion barrels per year. A simple statistic is world consumption of energy was 400 quads in 2000 which is projected (by EIA) to double by 2040. In round numbers the US consumes about 20% of world energy including approximately 22-23% of world oil energy. Using Professor Dale’s 10 percent goal for alternative fuels results in a conservative figure of 2.5 billion barrels of “oil equivalents” per year or 14 quads of energy. If the United States continues to consume about 22% of the world’s total oil production, the U.S. goal should be 3 quads of alternative liquid energy. This translates to an alternative fuels equivalent of over 500 million barrels of oil which must be adjusted for differences in alternative fuel energy densities. For example, ethanol provides about 2/3rds of the energy in gasoline or about 77,000 btus per gallon. We would have to produce around 750 million barrels of ethanol to reach the goal of 500 million barrels of oil equivalent. I have used these figures and reasoning to comment on Professor Dale’s question while limiting my comments to the U. S. situation at present. Collaborative efforts can and should be considered. Metric #2: Cost of the fuel. I agree with the basic premise but I feel the uninflated figure of $100 a barrel is low, considering the time to reach these goals. US oil has increased from $23/barrel in 2002 to at least $90/barrel in 2013. Including a relatively moderate inflation, this is equivalent to a 13% annual increase. If we project this rate out to a 2020 starting point, the price of oil could reach $190 per barrel at that time, while official government projections are less ($150/barrel). Metric #3: Capital cost of the fuel production system. New production systems usually cost more than those they replace but hopefully are more efficient and therefore less costly in the long run. Much of oil’s infrastructure can be used in the future – refineries, storage facilities, distribution systems, etc. Upstream oil production is expensive today considering the remaining oil regions such as off-shore, deep ocean, Alaska, North Dakota and other harsh climate areas; and advanced processes required such as fracking, enhanced oil recovery, deep wells and CO2 sequestration requirements. The real economic question is what will the return on investment be after all is said and done; therefore patient capital will be required. Alternative liquid fuels projects will not be inexpensive. They will most likely involve significant investment into land acquisitions, such as for agricultural purposes, but this type of investment is usually quite safe especially combined with long range real estate development. One of the major lessons of Colorado oil shale projects in the 1970s was the need for a long-range regional development plan during and after the project life. Alternative fuels must have a long vision as far as ultimate changes to resources, landscape, aesthetics, habitat, and plant, wildlife and human communities, including the viability of regional economics. This type of sustainable development could be very attractive and rewarding in many ways. We are talking about valuations of projects that could provide fuels forever on our own soils while reducing global environmental and socio-political stress. 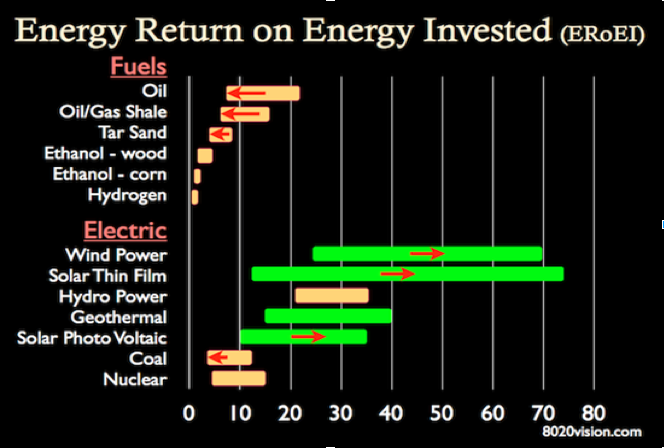 Metric #4: Energy Return on Energy Invested. I certainly concur with the need to achieve high EROIs but suggest that the fivefold requirement may be rather difficult to meet initially. Such a requirement would be very harsh on ethanol and other grain fermenting/distillations and perhaps on cellulose refining. Ethanol receives a lot of criticism yet we now produce almost 14 billion gallons of ethanol fuels per year or over 10% of our gasoline consumption, which has helped our country to reduce our oil dependence. The current ethanol production is about 333 million barrels per year or 222 million barrels of oil equivalent energy, which is 9% of the assumed goal of 2.5 billion barrels. The EROI for ethanol is controversial but seems to be between 1.5 and 2 at best. I am a big proponent of algal oil as a sustainable oil alternative but the lifecycle EROI for growing algae and converting the biomass to biodiesel is complicated and fickle. The calculations depend on various processes that might be involved which require ancillary electricity and thermal energy. For example, I believe that a dedicated solar system on-site is a compatible method to provide non-carbon based and non-polluting energy for our carbon-neutral production processes, while re-cycling Industrial waste CO2. I would therefore hope that quality of the production energy required would be considered as well as quantity. I think a lower EROI near 3.0 would be more prudent initially and then ratcheted up as part of the learning curve. Metric #5: Sustainability. The wisdom of the original sustainability advocates is that they intentionally left the definition broad enough for individual application as appropriate. Not every sustainable project will have perfect economic, environmental and social-cultural attributes. I believe that sustainability means at least making a contribution to the core attributes while considering all foundational elements. Some of the environmental concerns are very important, including the impact on our water and food supplies. We will never achieve worthwhile projects if we insist on ruling them out due to some negative effects. As far as economics, any reasonably successful renewable fuel projects should have strong net present values while providing new productive jobs for all levels of labor. Although ethanol has been criticized, many hardworking farmers, refiners and their communities have reaped decent profits that they deserve, while reducing U. S. gasoline consumption. This is the American way – economic motivations work. I believe that the redevelopment aspects of renewable fuel projects, especially in rural areas, will become very valuable while providing millions of needed jobs and billions of renewable liquid fuel barrels. I agree with Professor Dale that an essential requirement is renewability. I would add urgency to this requirement since peak global oil production will occur sooner or later, most likely sooner than that promoted by the current euphoria over our recent upswing in domestic oil production due to fracking. While the US domestic oil situation is improving, the global oil situation will continue to be tenuous. We should not wait for a catastrophic decline in global oil on which we still depend on to satisfy our high consumption. If we start now on a renewable fuels quest, what does it matter if peak oil does not occur in 25, 50 or more years? We will still be able to reduce our oil imports and carbon emissions, along with all related instabilities and unproductive costs, while increasing our security and peace of mind. In summary, renewable fuels will be good for our economy; they must be good for our environment; and they will positively contribute to our global society. If we think about one example — biofuels — we can quickly identify the fact that each alternative has its own constraints. For biofuels, the constraint that matters is acres — so we might think “oh, what matters is gallons (or BTU’s)/acre. But then if you consider that some fuels lend themselves to more efficient engines, it really becomes ton miles/acre. We cannot separate the fuel from the vehicle. Which leads to the next connection — which types of fuels support total systems that are highly efficient and use fewer vehicles to carry a ton mile? So it may be that figuring out how to move road to rail is more vital than the immediate characteristics of the fuels that power either road to rail. I really appreciate your comment. 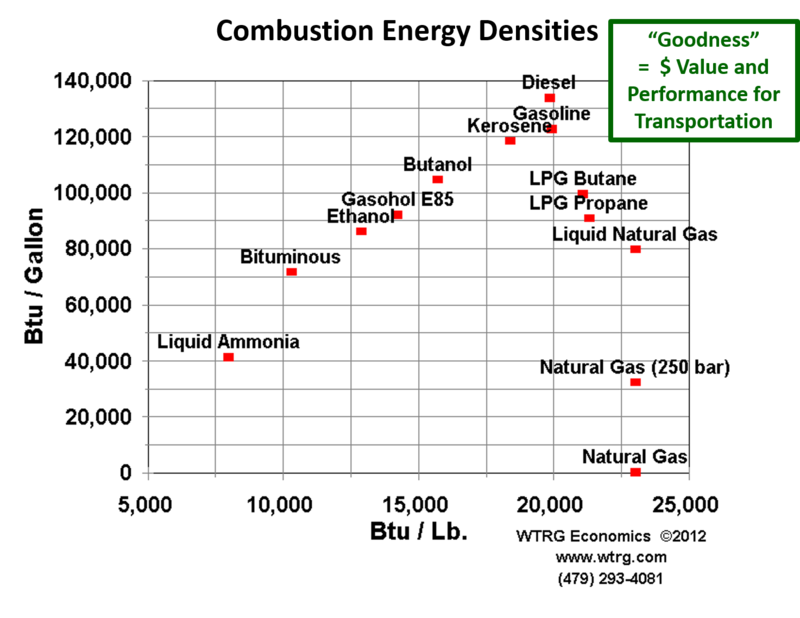 Your condensation of transportation biofuel considerations down to a metric of ton-mile/acre is really an expression of energy density. If we explicitly add in the necessary time component (ton-miles per day/acre), we have power density. Both of these are metrics I argued as essential in my first post above. I believe the real key to developing good energy policy is to look first at the necessary energy services that must be delivered, and then apply the right cost and benefit metrics to determine the best way to deliver those services. If we all did this right, I believe the Sierra Club and the American Petroleum Institute would agree on the metrics and the DOE and the EPA could all be brought to the table to consider actual data from real-world performance and objectively find agreement on what energy sources and fuels actually deliver the most energy service for the least environmental and social and climate and economic costs. I believe the reason for the widespread phenomenon of environmentalists opposing wind and solar farms in their backyards is the conscious or subconscious realization that a lot of acreage must be industrialized per watt of power produced by these alternatives. Whether it is recognized or not, power density is a key metric for environmentalists as much as it is for large utilities and city planners and industrial firms. Mr. Pope, these are all important and relevant comments. I especially appreciate your emphasis on the system. We have not been very good at thinking about the energy system as a whole. Most analysis has tended to concentrate on just one aspect and ignore other equally important aspects. That was partly my reason for proposing a set of metrics that would cover the system performance as a whole. Thanks Dr. Dale — the challenge is understanding the system well enough to do complete modelling — but we have to try. Dale once again asserts a “peak oil” premise that others dispute. Putting that aside, it’s certain that at some point in the future, even if not imminently, petroleum will be either too costly to burn or alternatives will emerge that are cheaper and equally useful. The criteria Dale suggests for judging the merit of alternatives to petroleum seem quite reasonable. The exception might be EROEI. The latter presumes that BTUs are fungible, which they clearly are not. The particular characteristics of a fuel source that matches well with application requirements may justify consuming a less-useful fuel to produce it. At least under some circumstances. Dale’s metric #3 is more realistic in that regard, since it appropriately values compatibility with existing infrastructure. “Sustainability” is the weakest of the criteria listed, in light of the murkiness of what it means. To his credit, Dale recognizes the highly ambiguous nature of the term and the arbitrariness with which it is often applied. However, it’s not always clear what “renewability” is supposed to mean either. For instance, some environmental activists exclude hydropower from their conception of “renewable energy.” Despite these problems, Dale is probably right to include sustainability on his list, if only because in practice others are likely to use it, whether justified or not. I thank Dr. Perelman for his response. I agree that EROEI can be difficult to calculate, and it is also true that not all BTU are created equal. Well-executed EROEI studies do take energy quality into account, but I decided not to go into all the details. And yes, there will always be some disagreement around the margins, but I think we have a pretty good overall handle on what petroleum substitutes are renewable and which are not. Sorry to have to say that I cannot get past the errors in your premises. We have no shortage of petroleum based fuel. Please check out what is going on in the commercial (real) world. It is called shale oil. In the event that gasoline remains as expensive as it is now…we have natural gas to fuel our vehicles. The market has already removed your subject as an issue for the foreseeable future. While your view is certainly the industry and government conventional wisdom, it is a very short term view that is fraught with significant under-reported uncertainties. We currently have only two significant shale oil plays in the US and they both will be nearing peak/plateau within the next half decade or so due to the rapid decline profile of unconventional oil and gas wells and capital limitations (both financial and physical). No doubt the extra few million barrels of oil a day that have been produced from these plays has greatly relieved pressure at the margins in the global oil market, and it is certainly helping our trade deficit. The problem is that conventional fields globally are declining on the order of 5-7%/year which means globally at least 4-5 million barrels a day of new production needs to go online every year just to keep up. Much of this declining production is being made up by more expensive and riskier resources which will continue to keep prices in the ~$100/bbl range for the foreseeable future. Often global oil numbers are reported as “total liquids” and those numbers do in fact look pretty good, especially since global demand has been kept in check by a combination of efficiency gains and anemic economic growth since 2008. However, if you look closer at the numbers, conventional crude oil production has been stagnant to declining since 2005 and is being replaces by imperfect substitutes like ethanol (lower energy density), tar sands (difficult to refine), and natural gas liquids (only partially useful for production of conventional transport fuels). The wildcard will be how the development of unconventional resources spread across the world. If multiple bakken level discoveries are made and can be produced with the same efficiency overseas, then the conventional wisdom that we don’t have to worry about liquid fuels may remain true, but that has yet to be seen based upon the limited number of underwhelming wells drilled overseas so far. The Age of Oil is winding down but not for the reasons stated. The stated assumptions that the marginal barrel of oil is more expensive to produce and refine would have been correct five years ago, as applied to heavy oil. Shale oil has a lower breakeven cost than heavy oil and it is much cheaper to refine. It is a throwback to over half a century ago when you could simply distill it to get the main useful constituents. This is a US phenomenon for now and the resource is estimated to be plentiful. There is also no geology based reason to assume that other countries will not be equally endowed. The reasons for the decline of oil usage are twofold. One is the current, and expected for decades in the US at least, disparity in oil and gas pricing. As long as the cartel holds sway one could expect oil to stay around $100 per barrel with excursions. So that assumption in the piece is probably right. But the 4 to 5 times disparity in price will drive arbitrage that is technically totally feasible. Most commodities made from oil can be economically produced from natural gas at $100 oil. This includes all the transportation fuels and the important chemicals methanol, DME, ethylene and propylene. The last two are the precursors for most “plastics” and synthetic fibers that we use. The projected certainty in long term disparity in price is what will drive the switch; uncertainty causes higher discount rates and dampens investment. The other reason for the decline of oil will be improved efficiencies in vehicles. The aggressive CAFE standards will help. But electric vehicles will lead the charge here. The reason for these vehicles is not the zero tailpipe emissions; they occur somewhere else (albeit more easily captured there). The reason is that EV’s are 60% more efficient than IC engines on a mine to wheel basis. That is mileage improvement at its most basic. The EIA has modeled that any reasonable target for carbon in 2050 will require over 40% contribution from using less. Conservation and substitution with lower energy substitutes ought to be our priority. Thank you, Dr. Rao. Conservation, substitution and efficiency improvements are certainly critical, and I do not wish to diminish their importance. But we are also going to have to deal with the depletion of a finite, non-renewable resource…petroleum, eventually. Given how critical petroleum is to our modern way of life, the sooner we do so the better. My purpose in proposing metrics was to give us a framework for intelligent discussion of petroleum alternatives. Timing I thank several commentators for mentioning the timing issue. I agree it is a key metric that I should have included. In general, it seems that capital required and timing ought to have some rough correspondence. But any new large scale replacement for petroleum will take decades to roll out. Thirty years of all-out effort might replace half of existing petroleum…if we are lucky. GHGs I was surprised not to get more push back from the commentators on the GHG issue, so I will raise the profile of this metric myself. I think it will be increasingly hard to get effective societal consensus on any large scale petroleum alternative that does not significantly reduce GHGs. The fight over the Keystone XL pipeline, the many battles over coal consumption, and so on are driven mostly by concern for GHGs. That issue isn’t going to go away, and it seems pointless to neglect it as a metric. Capital costs My thanks to several commentators who mentioned the issue of capital costs and sunk costs in the existing liquid fuel system. I agree we need to leverage the existing capital investments as much as possible, and my Metric #3 explicitly recognizes this issue. I comment more on capital costs below. Energy Quality in EROI I agree with Mr. Gallagher, Dr. Hall and Dr. Perelman that energy quality is important. I addressed this in detail during a previous discussion. For example, a solar PV system might have an uncorrected EROI of 3:1, but if it replaces coal (where we get most of our electricity), the actual EROI corrected for quality is 9:1. Energy, food and water competition. The energy, food and water systems are already mixed and are becoming more so. For example, the biggest user of water apart from irrigation is water for cooling in energy systems. Water shortages are increasingly constraining energy production particularly in the western US. I think we need to find ways to have these three human needs complement each other, rather than compete quite so much. Electrification of the transport system. I agree. We need to electrify as much transport as we can, particularly for rail. But if we produce that electricity with coal, we will greatly increase GHGs and hasten the day when coal reserves are depleted (as well as spreading tons of mercury around the world). Natural gas is better than coal for electricity, but still adds a lot of GHGs over time. However, electricity physically cannot replace some mobility services provided by petroleum (eg, for aviation, ocean shipping, long-haul trucking…). Even for light duty passenger vehicles, I think the most viable vehicles are hybrids like my Chevy Volt, 90.6 mpg after two years of driving in all conditions. This is high mileage to be sure, but it does use gas, about 100 gallons per year, and more if the weather is cold—batteries just do not like cold weather such as we have been experiencing this winter. So while I agree with Mr. Pope that moving from road to rail to transport our goods and ourselves is important, and deserves high emphasis, there is a large core of mobility services that simply cannot be met by electricity or rail. I have the same response to Mr. Rao. We need all the sustainably produced electricity we can get, but electricity is quite limited in its ability to replace petroleum. I estimate that a maximum of about half of total mobility services now provided by petroleum can be replaced by electricity. Is the Age of Oil Winding Down? Yes, it is, at least for cheap conventional oil. (This was also addressed in the previous discussion.) I suggest that folks who doubt this read the presentation by Steve Kopits (no wild-eyed academic) of Douglas-Westwood. In fact, the whole presentation is valuable, but for this particular point slides 17 and 18 are sobering and illuminating. Kopits shows that from 1998 through 2005, the world spent $1.5 trillion to add 8.6 million barrels per day of crude oil production. From 2005 through the present, the world spent $2.5 trillion on the legacy oil production system, but legacy (cheap conventional oil) fell by 1 million barrels per day over that time period. (This is the Red Queen race, going faster and faster to stay in the same place.) It is exactly the pattern one would expect if we had reached peak (cheap) oil. Yes, we have. Peak global oil (cheap conventional oil) occurred in 2005. The entire growth in world oil supply since then is due to unconventionals (shale oil, non-gas liquids, tar sands) and these will be much more expensive (again, see Kopits). As conventional cheap oil is depleted, prices will rise to reflect that fact. I look for oil at $150 per barrel as the new floor within the next five years. We shall see. Life is Good: We have shale oil (and natural gas) Tar sands, shale gas and shale oil and its associated NGLs are important resources, but I doubt very much if they will live up to the expectations of some. For example, the most optimistic, “unofficial”, estimate of the new oil available in the Bakken is approximately 25 billion barrels. If these unofficial estimates of the Bakken are right, that would be enough oil to supply all domestic needs for about four years. But the oil market is a global market. At a maximum, the Bakken represents only about one year of world oil consumption, even if it could be produced at an unlimited rate…which is physically impossible. And it doesn’t change the fundamental, underlying fact. Tar sands, shale oil and NGLs are not renewable. Eventually they will deplete also. Hopefully, they will give us some breathing room to act intelligently toward the future—which is the purpose of suggesting some metrics. My premises are mistaken My thanks to Mr. Chris Harto for his answer to Mr. Shortt and by implication, to part of Mr. Rao’s comments. Capital costs of oil replacements Tar sands, shale oil, NGLs, natural gas to liquids, coal to liquids are very, very capital intensive. When you combine this with the emerging capital discipline theme at the oil majors (see roughly slides 40-50 of Kopits), and high levels of governmental borrowing, it is difficult to see how the capital is going to be available at the same levels to expand supply of unconventionals. We have “enjoyed” (well, savers like me have not enjoyed it) about 6 years of very cheap money. If interest rates can’t go any lower, about the only place left for them to go is up. That will not be good for high capital cost oil replacements—which includes just about all of the replacements. Thanks again for your feedback. I hope I will get a few more comments in response to this post. Then I am going to draft a revised set of metrics and see where we go from here. Employing metrics for evaluating the prospects and performance of global primary energy supplies and fuels has been the bread and butter of my recent years working as a military strategic planner, war college instructor, and now management team member of a local power company customer of TVA. Dr. Dale provides a good initial list, but it does not address several key attributes which I will argue below should be added to complete the set. I am particularly gratified to see Dr. Dale propose Energy Return on Investment (EROI) as a critical metric. EROI is essentially the energy efficiency of energy production, and is tantamount to describing the nutritional value of the food that feeds civilization. His proposed 6:1 value exactly coincides with my own literature research as to the minimum level required to sustain the energy-intensive quality of life for a modern society such as Western Europe or the USA. It is critical to understand that below an EROI of 6:1, a nation with an industrial or post-industrial economy sinks into recession or worse as ever higher fractions of its GDP go toward chasing new energy instead of producing goods and services. Below is a chart of the distribution of US energy in 2011. The horizontal axis (logarithmic scale) records the amount of energy contributed by each source, and the vertical axis (also logarithmic) depicts the historic EROI ranges (ellipses) and recent calculations in the context of electric power generation (triangles). Note how a 6:1 EROI threshold helps to distinguish what is worth pursuing from what is not. The chart above reveals that we are hardly at the end of the age of oil; rather it is still doing yeoman’s work as a primary energy source. Claims that new oil discoveries have declined are based on the creative accounting of people like Jean Laherrere who backdate all modern discoveries in a large geographic location to the first discovery of oil in that place, discounting different depths and geologies and the evolution of technologies that enable economic recovery of previously unrecoverable resources. The logical extension of such an absurd argument would be to say no one has discovered any oil in North America since the first commercial well was drilled in 1859. The truth is that, in 2010 alone, 38,000 new wells were drilled in the USA and 87% of them struck oil or gas – but Laherrere would count none of these as new discoveries. World proved oil reserves have been growing faster than production and consumption since 1980 and currently comprise more than 1.6 billion barrels – more oil than has been consumed through all of human history to date. The following chart plots the growth of proved reserves and cumulative production on the left vertical scale, and the growth in daily production on the right scale. Overlaid on top as stop signs are the years and quantities for the occurrence of peak oil production as predicted by prominent alarmists since 1956. Global oil production is actually following a conventional sigmoid “logistic” curve toward a plateau, rather than the rapid decline of a symmetrical sigmoid peak oil “Hubbert” curve. This is because, as the first chart shows, oil competes with coal and natural gas for market share as a primary energy source, and oil production is governed by its competitiveness in the market, not simply by scarcity of the underlying resource. We are actually still at the beginning of the age of petroleum, particularly as chemical feedstock rather than as energy source. Oil only surpassed coal as a primary energy source in the USA in 1950, and much of the world is still living in the age of wood and charcoal household fire pits and hoping to move into the age of coal-electricity. Regardless of one’s opinion of the future of oil, we need to make some additions to the toolkit of metrics proposed by Dr. Dale. To his list I propose we add energy density, engine and infrastructure compatibility, power density, water footprint, greenhouse gas (GHG) emissions, and polluting emissions, and will attempt to illustrate the utility of each with practical examples. Energy Density is measured either gravimetrically (how much useful energy can be stored per unit of mass) or volumetrically (per unit of volume). Both are critical measures for fuels used for transportation. The lower the energy density, the poorer the fuel, as it imposes higher costs for storage and handling. Low energy density is particularly crippling for transportation systems because a greater structural fraction must be dedicated to fuel tanks and more energy consumed transporting the fuel and vehicle itself around instead of the payload. High energy density is essential for aircraft and rockets that fight against gravity and aerodynamic drag. Vehicles that use combustion fuels and remain within the atmosphere have the advantage of being able to harvest oxygen from the air and don’t have to transport it with them. As oxygen atoms are much heavier and larger than light and compact hydrogen and carbon atoms, this saves a tremendous amount of weight and volume and wasted. For this reason, pure hydrocarbons in general and diesel fuel in particular are at the apex of the energy density pyramid for liquid fuels (the top-right corner of the chart below is the best combination of volumetric and gravimetric energy density). The single oxygen atom in a molecule of ethanol is 35% of its mass, and this is why the energy density of alcohols is markedly lower than hydrocarbons. While pure cryogenic liquid hydrogen has more energy per unit of mass than diesel, diesel has 3.5 times as much energy per unit of volume. It is the materials science miracle of carbon, which is both a molecular backbone and efficient energy carrier in its own right, that it compresses stubborn hydrogen atoms together to the point that there is actually 63% more hydrogen in a gallon of common, room temperature gasoline than in a gallon of liquid hydrogen cooled to -423o F. Rather than being demonized, carbon should be recognized as the materials science master key to the hydrogen economy (as well as being the backbone of organic chemistry and of life itself). Mixing anything but hydrogen and carbon into hydrocarbon fuels dilutes the energy content and reduces the energy density. For example, adding an octane booster to a hydrocarbon fuel can enable a spark ignition engine to run at higher compression and temperature to achieve a higher horsepower, but this is done at the expense of removing energy from the gas tank and reducing overall energetic performance (e.g., reduced range, mpg, etc.). Adding oxygen to motor fuel is a particularly bad idea for reasons of engine and fuel system and infrastructure compatibility as well. Oxygen is very chemically active, and mixing it with hydrocarbons reduces their shelf life by destabilizing and breaking down the various molecules and polymerizing them into pastes and gums that do not combust well and clog filters. Additionally, alcohol, unlike hydrocarbon fuels, is inherently corrosive of metal, fiberglass, vinyl, polymer, plastic, and elastomeric (rubber) seals used in fuel systems. When combined with water, alcohols greatly amplify corrosion because they are polar (electrically imbalanced) molecules that, also unlike pure hydrocarbons, conduct electricity, are fully miscible with water, and tend to form aqueous solutions that stratify and settle to the bottom of tanks or pipelines instead of remaining well-mixed. Alcohol also functions exactly like MTBE to spirit benzene, toluene, and xylene through soil faster and deeper to more easily reach water tables and mix with groundwater instead of floating on top. All of the above are why not a drop of ethanol is allowed in the nation’s jet fuel supply or in any petroleum pipelines and must instead be trucked to refineries to be added to gasoline at the very end of the production process. The need for gasoline oxygenates (originally intended to reduce carbon monoxide in exhaust) disappeared with the 1993 advent of cars with engine control computers and oxygen sensors; and the legal mandate for oxygenation was removed from federal law in 2006. The practice continues because of political inertia rather than social benefit. The oft-touted gasoline octane boost of blended ethanol is actually minor (2-3 octane number (PON/AKI) increase for E10; E85 octane is only 94-96) and can be achieved with pure hydrocarbons by blending in a higher fraction of butane, iso-butane, pentanes, and aromatics, which are currently pulled from the natural composition of gasoline at the refineries to make room for volatile ethanol that would otherwise cause E10 to exceed EPA vapor pressure limits. Power density, another critical metric, is generally discussed in terms of the annualized rate of energy generation or consumption (average power) within a given land area. The power density of consumption can range as high as 500 W/m2 in high-rise urban areas such as Manhattan and Hong Kong. Since 50% of humans today live in large cities and that fraction is predicted to be 90% by 2100, the urbanized population represents the energy supply and demand challenge we all need to be focused on solving. The idea that solar panels on every roof or wind turbines in every back yard can deliver enough energy per person is only tenable for rural and suburban population densities. The newest crop of US commercial solar and wind farms deliver about 6 W/m2 and and 1.1 W/m2 respectively to the grid as intermittent AC electricity. Liquid fuel energy from biofuels is more than an order of magnitude lower at 0.315 W/m2 for corn ethanol and 0.064 W/m2 for soy biodiesel, and these numbers drop by several more multiples without intensive cultivation using non-renewable fossil fuel energy for fertilizer and agrichemicals or when using so-called “marginal land.” In contrast, an aging oil field like the one in Kern County, California that has been producing crude since 1899 delivers liquid fuel energy at a power density of 90 W/m2, and an average hydraulically-fractured gas well in the Marcellus shale formation yields 300 W/m2 in its early months and a lifetime EROI calculated to be between 60:1 and 120:1. 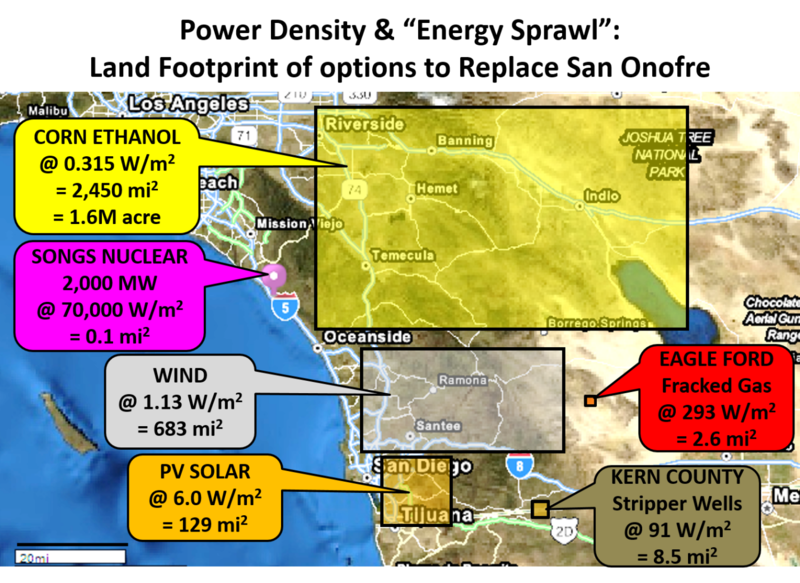 The chart below shows the land area that must be covered with solar panels, wind turbines, oil fields, or corn fields to replace the joules or BTUs of energy delivered to civilization by the recently retired San Onofre Nuclear Generating Station (SONGS) near San Diego. Soy biodiesel is not shown because it exceeds the dimensions of the map. 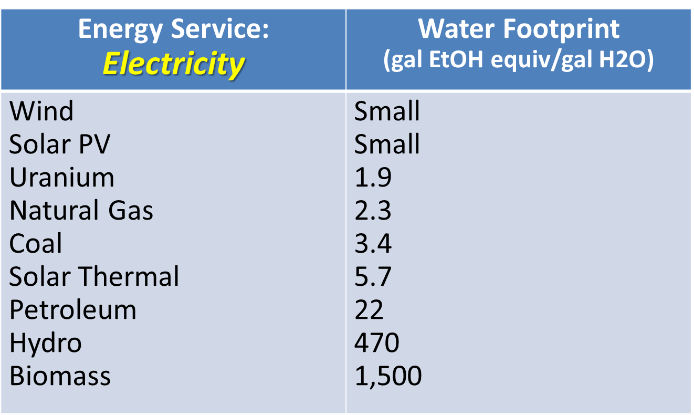 Land footprint is calculated by dividing units of energy service delivered per unit of time by the amount of land required to generate that power. When we plug in the numbers, we find that conventional terrestrial oil historically requires the industrialization of about 3 acres per MW, while solar requires 40 acres/MW, corn ethanol requires 800 acres/MW, and soy biodiesel requires 3,600 acres/MW. The fractions of land within the boundaries of a wind farm and a tight gas fracking lease that are temporarily and permanently impacted are virtually identical, and both permit other land uses for the unimpacted fraction. Yet, wind requires 200 acres/MW while hydraulic fracturing typically requires only 1 acre/MW in the early years of production tapering off to approximately 10 acres/MW in the out-years. Land use is a zero-sum equation, and the effects of land apportionment are of huge immediate consequence to human and environmental well-being. It is now estimated that the world-wide burning of ancient carbon sink forests to make way for bioenergy crops has created a “carbon debt” of already emitted GHGs that will take 350 years to repay. With the world’s population increasing to 9 billion by 2050 and the need to put approximately 300 million additional acres of land into food cultivation to feed us all, there is arguably no higher social cost than land footprint . . . except for perhaps water footprint. Water Footprint is a measure of how much fresh water is consumed, polluted, or otherwise removed from the ecosystem by a given activity. One-third of the nations of the world are currently evaluated as “water poor,” and that fraction will grow to two-thirds by 2050 due to demand outstripping sustainable supply of renewable and non-renewable “fossil” water resources. The USA itself is not immune and is rapidly depleting its own Central Valley and High Plains aquifers. Using a unit of energy the EPA and global environmental community likes, we can normalize net energy production to lifecycle water use in terms of gallons of ethanol energy-equivalent per gallons of water consumed or polluted. The results of such a gallon-per-gallon analysis are compelling. While coal and natural gas electricity have water footprints in the single digits and conventional refined petroleum fuels have water footprints of only 2.3 to 15 gallons-per-gallon including all the water used for enhanced recovery and hydro-fracturing and refining, biofuels range from 800 gallons-per-gallon for sugar beet ethanol to 19,900 gallons-per-gallon for jatropha biodiesel. Military strategists have long recognized that water scarcity is already a flash-point for international conflict, and that food and water will likely drive more instability and conflict in the future than petroleum. Greenhouse gas (GHG) emissions recognized by the UN Intergovernmental Panel on Climate Change (IPCC) include not just the much-maligned carbon dioxide, but also several other far more potent global warming gases. Another culprit gas is nitrous oxide (N2O), which is 298 times more powerful in warming the atmosphere, happens also to be the number one ozone-depleting gas, and is emitted principally by the manufacture and application of ammonia fertilizer. This seriously undermines the strategy of using intensively cultivated crops as the basis for a national fuel supply. Similarly, nitrogen triflouride (NF3) is a GHG 17,200 times more powerful than CO2 and is principally released by solar panel and computer chip manufacture. It is neglected facts like these that invalidate the current administration approach to calculating social costs by focusing only on one dimension of harm (climate change) and upon only one agent of that harm (CO2). Emissions of all well-mixed, non-condensing GHGs need to be counted against each prospective fuel candidate, and their costs weighted in accordance with the IPCC global warming potential for each. For example, any tax on CO2 should be applied to methane at 34 times the rate, to N2O at 298 times the rate, and to NF3 at 17,200 times the rate if we want to properly reflect their respective social costs and steer behavior away from the things most likely to promote climate change. Farmers and solar power proponents and computer manufacturers may not like the implications, but cold logic needs to trump political expediency if we are truly going to solve problems instead of making things worse. Nowhere is this reasoned approach needed more than within the US Environmental Protection Agency. The EPA regulates a host of polluting emissions to protect the nation’s air, water, and land. However, the implementation is not generally sensible nor evenhanded. For example, particulate emissions for diesel engines have been dramatically curtailed since the introduction of ultra-low sulfur diesel in 2006 to the point that char-broiling a hamburger now produces more emissions than an 18-wheeler driving 143 miles. But these regulations prevent the US introduction of super high-efficiency turbo diesel cars like the Volkswagen Polo that gets 81 mpg and scores much lower in every other category of polluting emissions than all gasoline and diesel cars on the road. Coal emissions have been regulated by the EPA to the point that almost as much electric power plant pollution now falls in the US from China’s coal plants as from our own. Yet, the same administration is actively promoting the burning of biomass in household wood stoves and boilers as an alternative energy source, even though the most deadly form of air pollution in the world according to the World Health Organization is indoor air pollution from burning biomass for heating and cooking fuel. There is great irony in the fact that the EPA’s Renewable Fuel Standard (RFS), by which it has subsidized and mandated the production and blending of biofuels, is now known to have increased both GHG and polluting emissions compared to the use of conventional gasoline. The National Academy of Science has declared, and the EPA itself admitted, that corn ethanol in gasoline has increased ozone and particulate emissions to a degree which is estimated to be killing an additional 245 Americans each year. A new study based on actual RFS outcomes to date instead of EPA’s now disproved rosy assumptions predicts that full implementation of RFS from 2015 to 2044 will result in 28 percent (300 million tons) more lifecycle polluting emissions than gasoline. The mandates of responsible governance dictate that no government agency should be allowed to implement rules and regulations that increase the mortality of its citizens, and that no environmental protection agency should implement programs that increase the pollution of the environment. Land footprint, water footprint, polluting emissions, health impacts, food competition, etc., are all equally valid metrics of social cost as GHG emissions, and all of these others are of more immediate effect. These all need to be accurately quantified for each fuel and energy alternative before policies attacking any single option or any single metric are formulated and implemented. Note: See http://wici.ca/new/resources/occasional-papers/#no.4 for extensive discussion and citations to substantiate the claims made throughout this piece. IKE: I appreciate the hard work you have put into your comprehensive analysis but I must point out some basic errors in your presentation. For example, your statements in the paragraph below your first figure that “World proved oil reserves … currently comprise more than 1.6 billion barrels…“ should read 1.6 trillion barrels, or we would be in big trouble. The recent world production of oil and liquid fuels is about 30 billion barrels per year, so 1.6 billion barrels of reserves would give us less than 20 days before we had to bail out! You do not state the source of your data so it is difficult for us to get on the same page. EROI Figures: Your data show ethanol and biodiesel EROI’s about 2, wood and biomass wastes about 3, and hydro around 4 (the number for hydro should be very much higher). Regardless, it is difficult to discard these renewable fuels as unacceptable, since they represent over 5 quads or 5% of our total energy consumption (about a trillion kWh from hydro and biomass waste, and 15 billion gallons of biofuel). This is why I suggested an interim EROI ratio of about 3. I agree that a goal of 6 should be used for long-term preferential planning, but the old saying that a “bird in hand is worth two in the bush” applies well here. I’d rather count on a proven, lower EROI instead of an unproven, risky EROI of future technology. Let me add that I am not endorsing food crops for our ethanol and biodiesel fuels since they require over 10% of our limited prime croplands of 400 million acres, and consume large amounts of water, fertilizer and energy as you have pointed out. Peak Oil: Drs. 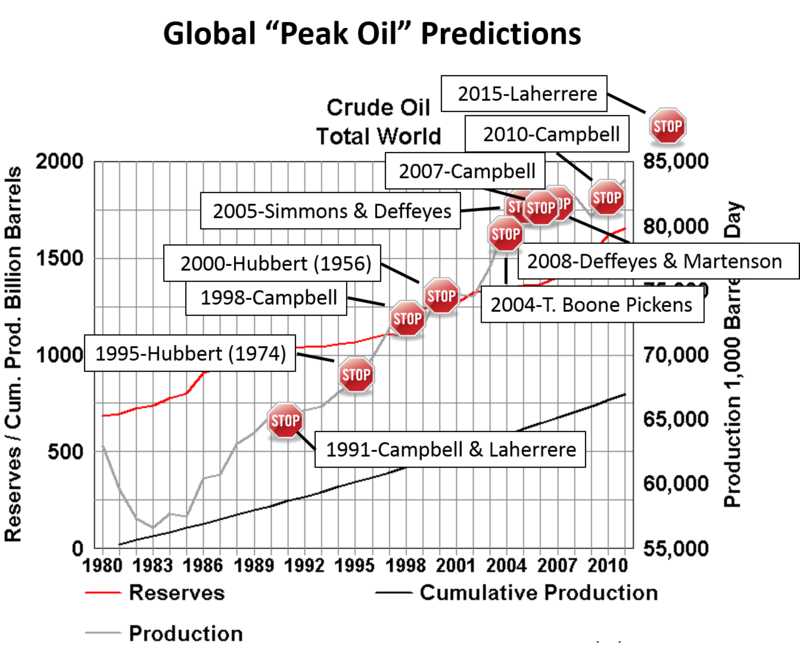 Colin Campbell and Jean Laherrere are distinguished geological scientists in the same mold as Dr. M. K. Hubbert, who correctly predicted US Peak Oil about 14 years before it occurred in 1970, in spite of being ridiculed by his peers. Dr. Hubbert was off in his prediction of global peak oil occurring in 1995 (as well as me and other researchers) for specific reasons. These include inaccurate data, unforeseen shifts in economics, and inability to factor in new technology. I am trying to revise my peak oil prediction (Peak oil analyzed with a logistic function and idealized Hubbert curve, Energy Policy, 39, 2011) by assessing additional economically recoverable oil resources based on estimated frackable formations, but this is quite difficult to do. The US oil production from fracking is now way up but so is its depletion rate, since we are literally scraping the bottom of the barrel. Fracking is like drinking a thick milk-shake through a big-diameter, slippery straw. It comes up very fast (production) but the remaining liquid goes down very fast also (depletion). Hubbert was wrong on global peak oil because he had no accurate knowledge of new resources such as Alaska, which has added at least 20 billion barrels to the global inventory, and certainly he had no idea about the extent of recoverable oil in place due to fracking, which could be 20, 30 or more billions of barrels. These and other newly discovered resources and technologies do push out the predicted peak in time and quantity, but not by very much. Every increment of peak oil push-out comes with a price, both economically and politically. I spent a week last November in Williston, North Dakota assessing the Bakken situation. The oil production technology and efficiency are very good with few mishaps, but socio-economic problems are developing that may effectively limit the oil production. Finally, the discussion beneath your second figure is a bit confusing. 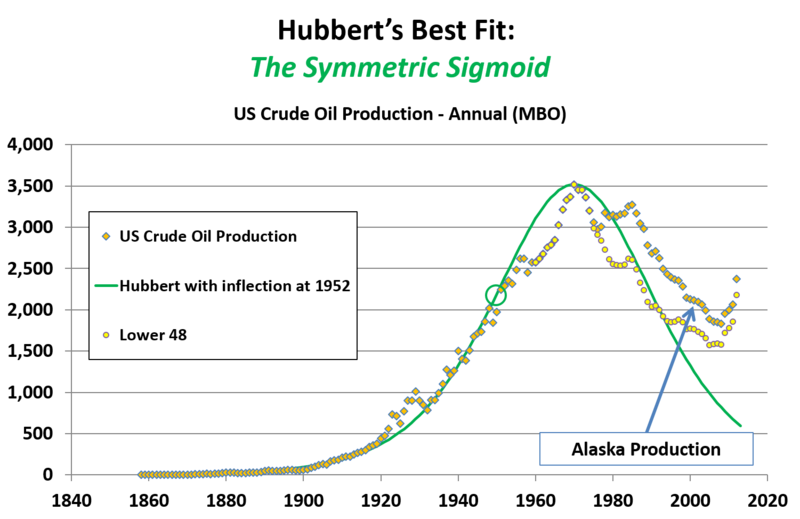 Cumulative total oil production (all the oil ever produced) creates a logistic curve which represents the integral of the bell-shaped Hubbert curve, which denotes a rate of production, such as barrels per day. 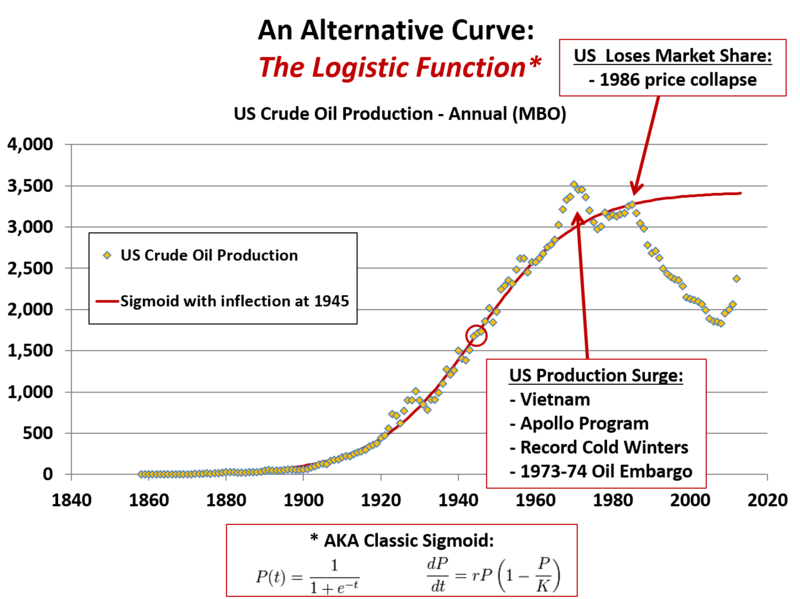 The midpoint of the logistic cumulative curve generally coincides with the peak of the Hubbert Curve (where its derivative equals zero), hence the name Peak Oil Production. When the logistic cumulative curve begins to plateau, it is closing in on its carrying capacity limit or ultimate resource value. This is when we are really in trouble and the game is over. Peak oil is not the end of oil but it is the point at which global oil production rates will begin to decline. The world might have 50 or 100 years of oil left which will depend on our consumption rate. But the oil will become very expensive. Semper Fi. Thank you for the close inspection of my post. 1. You are absolutely correct about 1.6 trillion instead of billion for proved crude oil reserves. What’s 3 orders of magnitude between friends? Good catch. However, I think you are mistaken in your other criticisms. 2. If you look at the EROI chart again, I think you will see that Hydro is indeed depicted with a very high EROI. Weissbach et al. calculated 35:1 for open-loop hydroelectricity, and that is the red triangle in my ellipse. Other estimates range to greater than 100:1. I think my depiction is accurate and you may have confused it with Wind. 3. As to “accepting” low EROI sources of energy, it is simply a question of the standard of living and energy-intensity a nation is willing to tolerate. An agrarian civilization like that of Rome built and maintained with the labor of oxen and slaves can survive on an EROI of 2:1 achievable with alfalfa and wheat. But if you want to build with steel and concrete and glass, and have cars and airplanes and smart phones, and have machines do the hard labor instead of slaves, you need a minimum of 6:1 to just sustain it, and much higher to develop and grow it. Energy-efficiency helps, but energy efficiency requires upfront costly R&D to achieve, which itself depends on high-EROI energy to develop the new technology. As Dr. Hall likes to point out, other “non-productive” things like education and the arts can only exist in high-EROI contexts, and go away when every person spends their whole day foraging for or cultivating their daily ration of energy. When we peel back the onion on liquid biofuels made from intensively cultivated crops such as corn ethanol and soy biodiesel we find that they are 40-95% embedded fossil fuel energy. And because of their low EROI, the fossil fuel energy that went into producing them would have yielded much more useful energy service to civilization if it was invested in producing alternatives with higher EROI such as refined fossil fuels instead. We need to think like investors comparing alternative ROIs and consider opportunity costs. Getting a small positive return is not good enough. We need to shop for the best return. Comparing corn ethanol’s 1.25:1 EROI with a lowball estimate of 8:1 for gasoline reveals that I get 28 times more return on an investment of energy into gasoline than into corn ethanol (If I invest 1 unit of energy into corn ethanol, I get 1/4th of a unit net profit back. If I invest that same unit of energy into gasoline production, I get 7 units of net profit back. 7/0.25 = 28). The truth is we would be consuming less finite fossil fuel if we simply used 100% gasoline and stopped cultivating an industrial corn crop greater than Russia’s entire annual grain harvest just for ethanol, and saved all the natural gas and petroleum that went into the fertilizer and herbicides and pesticides and farm equipment fuel and transportation and processing plant energy. Making liquid biofuels is one of the least efficient uses of fossil fuel energy we have yet devised. This energy efficiency of energy production (or lack thereof) also carries over into GHG and polluting emissions and land and water footprint normalized to unit of energy service delivered. High EROI is the way to go for both the economy and the environment. 4. I have a very different view of where we are on the trajectory of fossil fuel energy than you do. The real question to answer — and it is difficult to collect the necessary data — is what is the EROI of fossil fuels really doing? Relying exclusively on oil production numbers and selectively fitting a favored curve that is shaped exclusively by increasing scarcity (Hubbert’s premise) is to ignore a host of supply side and demand-side economic factors such as competition and substitution. I believe we need to take a more sophisticated view and analyze how the production of crude oil (or any other fossil resource) is responding to the investment of effort. This approach is complicated by the fact that, superimposed on a linear progression of depletion there is a cyclical process of economic feast and famine that has existed since 1859 that involves periods of high capital investment, followed by overproduction and gluts, followed by price collapses, followed by minimal capital investment, followed by perceived scarcity, followed by price spikes, followed by large capital investment – lather, rinse, repeat. Consumer gasoline prices have hit the same inflation-corrected peaks in 1920, 1934, 1980, and 2008. Computing EROI during the shock at the peak of price and capital investment (i.e., 1980, 2008) as peak oilers are wont to do yields artificially low numbers. Computing EROI during the glut at the trough of price and capital investment (i.e., 1957, 1987), yields artificially high numbers. We really need to compute EROI as the integral of produced new energy services over the integral of invested energy services, and adjust for the 5-15 year lag between capital investment and ROI. My rough attempts at such an approach show that the USA has produced and is still producing 35-40 barrels of oil per foot drilled. The average well is deeper and more expensive, but the yields of deeper wells tend to be higher. I am not sure how the cost or energy per foot drilled has changed over time, as the more expensive technology employed also increases the efficiency of drilling, increases ultimate recovery, and reduces the number of dry holes. It should be noted that the product being produced by the newer domestic wells (pre-salt oil, tight oil, more natural gas) is lighter and sweeter than shallower oil and requires less refining energy. Our analysis also need to embrace the recent dramatic discontinuity that we now have the technology to economically extract energy from some source rock and from tar sands, not just oil and gas which has migrated into reservoirs. This has added a huge new fraction in-ground energy to our plate. Methane hydrates may be next. EROI is not fixed by the innate attributes of a raw material, but is a function of the approach used to harvest its energy and to upgrade it into energy services. Tight gas in shale was recently uneconomical to harvest but now is being extracted in the Marcellus with EROIs analyzed to be greater than 60:1. Coal has much more accessible energy than pitchblende, but humans have discovered how to extract much higher EROI energy from uranium nuclei than from hydrocarbon molecules. We are innovative autotrophs that continue to invent technology that improves the EROI of our processes, and that makes less accessible energy resources more accessible. 5. Let me clarify my point about symmetric sigmoids (e.g. a Hubbert curve) versus classic sigmoids (e.g. a logistic curve). In my comments above, I was referring to annual oil production for both, not cumulative production. I allege that peak oil alarmists are indulging in the self-fulfilling prophecy of selective curve-fitting. To data which continue to show a tapering but continuous secular trend of increasing global production, they apply a curve which is mathematically constrained to predict symmetric decline. In this manner we are always portrayed as at the edge of the cliff. I believe that scarcity does not yet dominate either the production or consumption of oil and we should not predicate our analysis upon that assumption. To prove my point about false reliance on production curves I offer the following four examples. 1. Hubbert’s curve for US crude oil production. 2. Multiple Hubbert-like curves for personal computer production in the 1980s. 3. 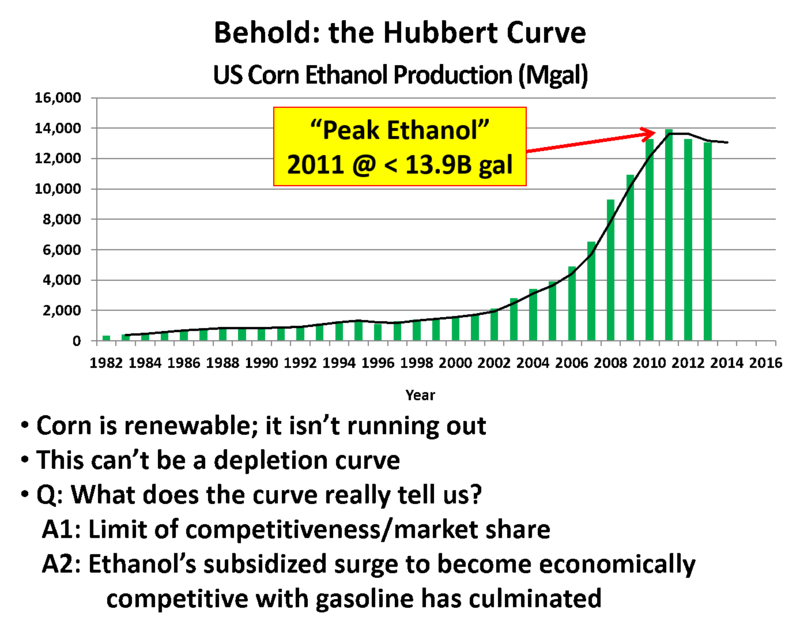 A Hubbert curve for US corn ethanol production showing its peak in 2011. 4. A logistic curve for US crude oil production. Accepting the first chart and Hubbert’s graph as a good fit requires the usual apologetics that excuse Hubbert for not anticipating Alaska or tight oil despite the fact that he discussed shales and tar sands and offshore oil extensively in his 1956 paper. The second chart illustrates that Macintosh computers followed a production trajectory very similar to US oil production, and that production curves in general peak for reasons of shifting demand and loss of market share rather than scarcity of supply. 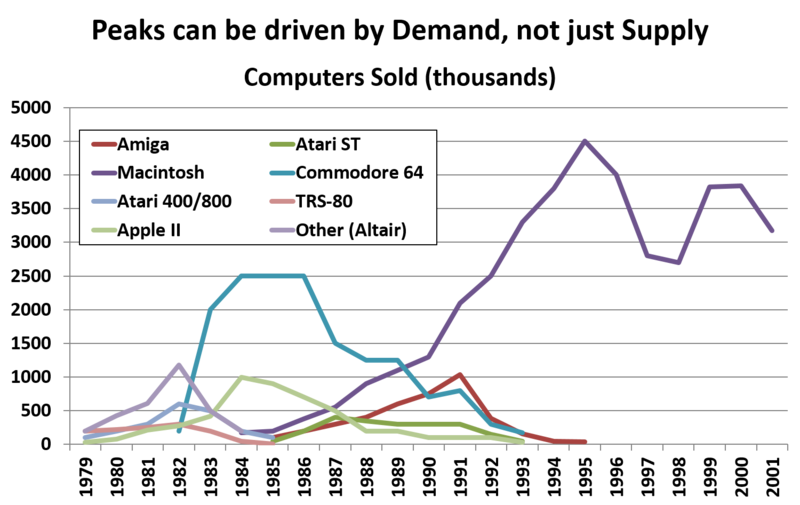 The world did not run out of its finite supply of Commodore 64s; another product came along that was more competitive and the market shifted in classic substitution. The third chart illustrates that US corn ethanol production experienced a Hubbert peak in 2011 even though it is a “renewable” resource. Of course we all know that refinery demand not farmer supply is the limiting factor because of suspended VEETC and finite RIN tax credits and the 10% blendwall. Finally, in the fourth chart, I indulge in my own selective curve-fitting and propose that the logistic curve is more appropriate for a product or resource that is still fighting to find its natural market share as it elbows other competitors out of the niches it fills best and loses ground elsewhere. Oil’s best use is transportation fuel and chemical feedstock, and other alternatives are more competitive for space heating and lighting and fixed location energy applications. The world’s market for oil (and coal!) is still growing as developing nations become more energy-intensive and require energy with higher EROI than biomass can deliver as wood and charcoal and dung, or the even lower EROI of alcohol or biodiesel, or the even lower EROI of “drop-in” hydrotreated fuels. But increasing energy efficiency, decreasing industrialization of the economy, and population densification by migration to cities (as well as other factors) also help to slow energy demand growth. I believe the empirically derived asymptote for my logistic curve fit of US oil production at 3.5 billion barrels per year (9.5 million bpd) reflects the natural carrying capacity of the US market for domestically produced transportation fuel, and the upper limit for US production. However, at any moment in time, actual domestic production will likely be something less due to the shifting equilibrium of a host of countervailing domestic and global economic forces. It would be a mistake to use US production at any moment in time to infer the scarcity of resources in the ground, or to predict a rising or falling secular trend will continue indefinitely. If you compare the first and last charts above, the inflection point itself is of note. Hubbert determined his to be 1952 based on fitting the area under his curve to the assumption of 150 billion barrels of recoverable US terrestrial and offshore oil. That curve lead him to predict US peak oil production in 1970, but there was no underlying reason for why 1952. When I fit a logistic curve to the same production data, the inflection point for best fit was 1945. It is interesting to note that 1945, as the end of WWII, was the end of a massive industrial campaign in the USA, and was also the year that the energy-intensive industrial fraction of US GDP shifted from majority to minority status, as services and government crossed over and took the lead. I think the Hubbert curve and the logistic curve both have something to tell us about the future of oil as an energy resource. Both are bounding curves, with the Hubbert being a minimum that applies when innovation ceases or no longer achieves EROI gains, and the logistic being the market-constrained maximum achievable for the most successful innovators. Reality at the small scales of individual wells looks like a series of successive Hubbert curves peaking for each iteration of recovery technology. But reality at the scale of global oil production looks very faithful to a logistic curve. Considering that the current revolution in oil production is happening ashore in the Continental USA where 75% of the world’s oil wells have been drilled and which was proclaimed to be the most picked over and depleted oil patch in the world by alarmists not too many years ago, I believe it is not unreasonable to be bullish about the prospects for similar results elsewhere in the world. The USA should logically have no geographic exceptionalism in its endowment of conventional oil reservoirs, oil shales, tar sands, source rock, or pre-salt oil, (not to mention coal or natural gas or methane hydrates or uranium), especially when resources miles underground are now accessible. It should not be surprising that the largest known reserves are exactly where we have looked the hardest and longest. As we apply our new technology to new geography, we seem to be seeking and finding new oil just fine. Much of it is at the vertical and horizontal frontiers of existing fields as the oil majors like to drill under the streetlights where they already know the geology; but far flung pilot wells around the world such as were recently drilled into pre-salt oil off the west coast of Africa are painting a picture of symmetric oil resources that indicate oil’s distribution is more egalitarian than current production would suggest, and that we can expect to see large new fields opened as well as continued “reserve growth” in existing fields. In summary, I do not see evidence yet of the approaching end of economically-recoverable oil, and believe the trajectory of global production will continue along a logistic curve rather than peak and decline. If we can get at some solid EROI values for crude oil, monotonically declining EROI would be the leading indicator that would help us determine when that day might actually arrive. IKE: I did misinterpret your diagram on hydro EROI and I stand corrected. I’m glad we can at least agree that hydro is an important renewable energy with a high EROI. We obviously have different philosophies on EROI requirements. I believe there is a likelihood of peak oil occurring within the next 10 to 20 years, so I suggested a survival EROI of 3 as a starting point. I would prefer an EROI of 6 if those fuels could meet all of our energy needs. I have included two charts of EROIs for discussion purposes. The first chart is taken from 8020vision.com and is credited to an article by Guilford et al. in Sustainability 2011, titled “A New Long Term Assessment of Energy Return on Investment (EROI) for U. S. Oil and Gas Discovery and Production”. The second chart is mine. The arrows in the first chart indicate the direction of decreasing or increasing EROIs. This chart shows fossil fuels with moderately high EROIs that are declining, and initial biofuels with low EROIs; while some renewable energies have very high EROIs. 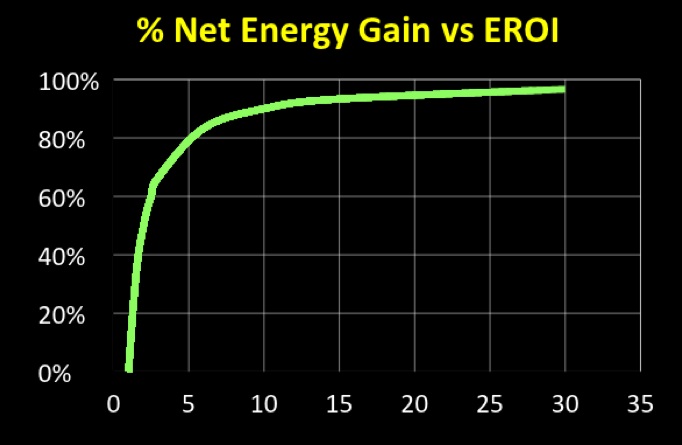 Although EROI is important, the net energy gain (EROI-1)/EROI is more meaningful to society, where a steep net energy gain starts at an EROI of 1, and rises to 67% at an EROI of 3. I think it is much more important to establish biofuels even with low EROIs of 3 than to target only EROI fuels of 6 or greater. The analogy is a large ship with no lifeboats versus adequate lifeboats for survival, even though they may not be equipped with the amenities of our planet’s voyage that you so eloquently have explained. Biodiesel is an embryonic biofuel of importance to our society, primarily made from soybeans (soy). 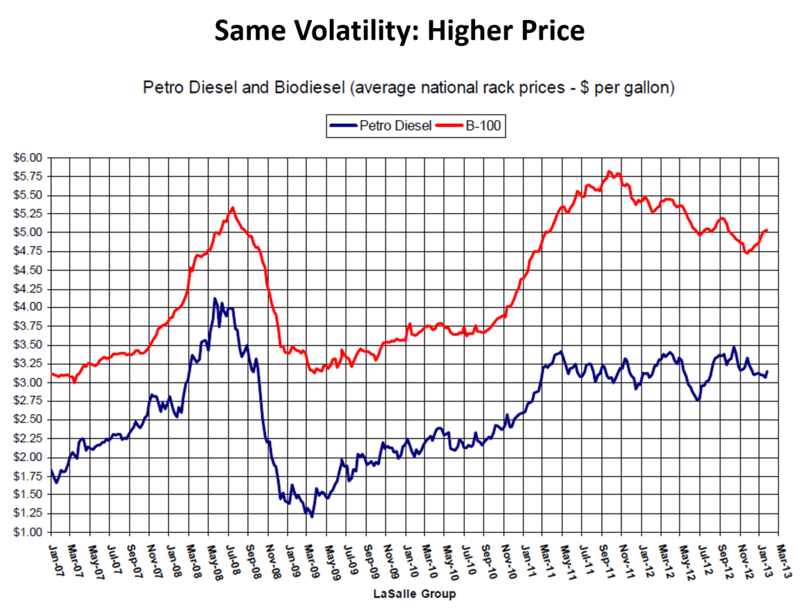 Biodiesel blends well with petro diesel and helps to keep our transportation, construction and agricultural systems intact. We produced about a billion gallons of biodiesel last year, of which over 50% is from soybean feedstocks. A study (Energy balance of soybean oil biodiesel production: A review of past studies, Pradham et al., in Transactions of the American Society of Agricultural and Biological Engineers, 2008) reviewed several EROI analyses published by reputable organizations with a mean-value EROI of 2.11. 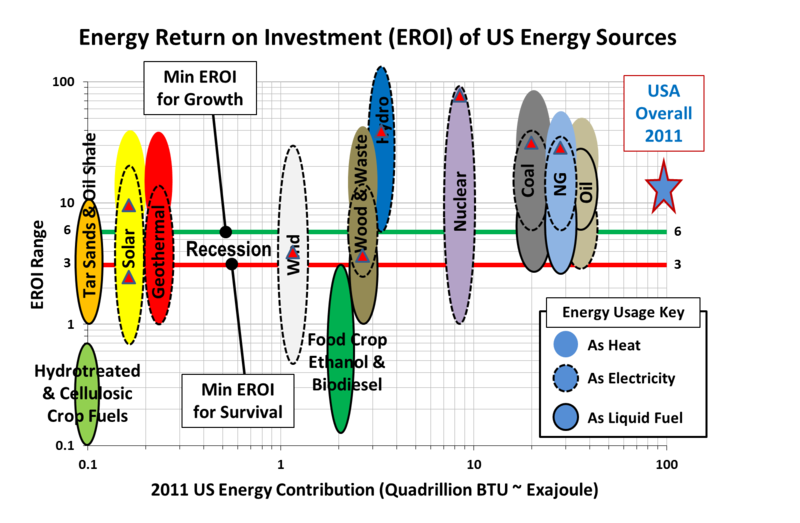 The revised and updated analysis shows a mean EROI of 2.55, even when based on a more conservative definition of complete life-cycle analyses of energy-out divided by all energies-in including renewable and non-renewable origins. This increase in EROI represents a net energy gain form 53% to 63%. Furthermore, the authors used a new Economic Sustainability Ratio (ESR) to account for the value of the fuels produced, equal to the ratio of soy biodiesel revenues divided by costs of all applicable growth and production energies required. The computed ESR was 4.43 which is very favorable and means that on average, soy biodiesel produces 4.43 times the cost of all energies required in its production. This shows a truly renewable and economically sustainable biofuel. The same analysis as above applied to ESR would suggest an increase of 77% of economic sustainability for soy biodiesel fuel. IKE, thank you for your treatise on a novel application of a Logistic function applied to oil production rates, but it is apparent that we still have fundamental differences on the interpretation and application of Logistic and Hubbert curves. However, this forum is not intended for that type of debate. Regards. I think that one has to look at the final cost to the consumer. I would postulate (without proof) that there is “infinite” amount of oil at $1,000 a barrel. To understand the Hubbert revised curve one has to add the cost of the product. The original Hubbert curve used as reference oil at $10-$20. Arguably oil at $100 is not the same product as oil at $20. In other words, it seems that we are now tracking a separate Hubbert curve for oil at $50-$100. The difference between the oil curve and the computer curve is competition. New generations of computers undercut the price of old generations. Today the price leaders are the smart phone and the “pads”. In oil world that did not happen. We simply replaced cheap oil with expensive oil. Now, I know that oil used to be much more expensive in the 18 hundreds. Back than oil was a luxury commodity. Today its a strategic commodity. I am very acquainted with Megan Guilford’s EROI paper. It offers a detailed look at oil and natural gas, but does not address any of the other energy sources on the 8020vision.com chart you provide above. In fact, the words “wind” or “solar” or “biofuel” do not even appear in Guilford’s study. The high EROI numbers for wind and solar and the low EROI values for coal and nuclear electricity on the colorful chart you provided are not supported by the most rigorous studies. Such numbers are often found on political agenda and “green” energy advocacy sites, but are usually based on very simplistic analyses that treat all kWhs as equivalent, making no regard for whether they are at the generator bus bar or consumer meter, and also taking no account for the backup generation, ancillary grid services, and/or storage required to upgrade arbitrarily intermittent, asynchronous. non-coincident power to dispatchable, synchronous, load-following power. When these factors and costs are properly counted and allocated to compare apples to apples, the true EROIs for wind and solar emerge in the low single digits as per Weissbach et al. Brandt, Adam R. “Oil Depletion and the Energy Efficiency of Oil Production: The Case of California.” Sustainability 3, no. 10 (October 12, 2011): 1833–1854. doi:10.3390/su3101833. Callarotti, Roberto Cesare. “Energy Return on Energy Invested (EROI) for the Electrical Heating of Methane Hydrate Reservoirs.” Sustainability 3, no. 11 (November 7, 2011): 2105–2114. doi:10.3390/su3112105. Department of Energy. “Fact Sheet: Energy Efficiency of Strategic Unconventional Resources.pdf.” Fossil Energy, January 29, 2012. http://fossil.energy.gov/programs/reserves/npr/Energy_Efficiency_Fact_Sheet.pdf. Energy Information Administration. “Total Energy Flows.” Energy Information Administration, 2010. http://www.eia.gov/totalenergy/data/annual/diagram1.cfm. Guilford, Megan C., Charles A.S. Hall, Pete O’ Connor, and Cutler J. Cleveland. “A New Long Term Assessment of Energy Return on Investment (EROI) for U.S. Oil and Gas Discovery and Production.” Sustainability 3, no. 10 (October 14, 2011): 1866–1887. doi:10.3390/su3101866. Hall, Charles A. S., Stephen Balogh, and David J.R. Murphy. “What Is the Minimum EROI That a Sustainable Society Must Have?” Energies 2, no. 1 (January 23, 2009): 25–47. doi:10.3390/en20100025. Hall, Charles A.S., Bruce E. Dale, and David Pimentel. “Seeking to Understand the Reasons for Different Energy Return on Investment (EROI) Estimates for Biofuels.” Sustainability 3, no. 12 (December 13, 2011): 2413–2432. doi:10.3390/su3122413. Hamilton, Abbe, Stephen Balogh, Adrienna Maxwell, and Charles Hall. “Efficiency of Edible Agriculture in Canada and the U.S. Over the Past Three and Four Decades.” Energies 6, no. 3 (March 19, 2013): 1764–1793. doi:10.3390/en6031764. Hill, J., E. Nelson, D. Tilman, S. Polasky, and D. Tiffany. 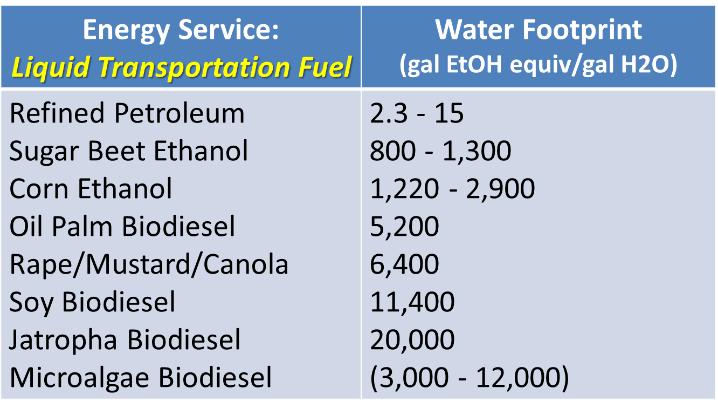 “Environmental, Economic, and Energetic Costs and Benefits of Biodiesel and Ethanol Biofuels.” Proceedings of the National Academy of Sciences 103, no. 30 (2006): 11206. Homer-Dixon, Thomas. “Colosseum Calculations.” The Upside of Down. Accessed February 20, 2012. http://www.theupsideofdown.com/rome/colosseum/. ———. The Upside of Down : Catastrophe, Creativity and the Renewal of Civilization. London: Island Press, 2006. King, C. W. “Energy Intensity Ratios as Net Energy Measures of United States Energy Production and Expenditures.” Environmental Research Letters 5, no. 4 (October 1, 2010): 044006. doi:10.1088/1748-9326/5/4/044006. King, Carey W., and Charles A.S. Hall. “Relating Financial and Energy Return on Investment.” Sustainability 3, no. 10 (October 11, 2011): 1810–1832. doi:10.3390/su3101810. MacKay, David. David MacKay: A Reality Check on Renewables. Warwick UK: TEDx, 2012. http://www.ted.com/talks/david_mackay_a_reality_check_on_renewables.html. Morris, Ian. “Social Development [Why The West Leads — For Now],” October 2010. http://ianmorris.org/docs/social-development.pdf. ———. Why the West Rules–for Now: The Patterns of History, and What They Reveal About the Future. First Edition. Farrar, Straus and Giroux, 2010. Murphy, David. “EROI Update: Alberta Tar Sands Toe-to-Heel Air Injection.” The Oil Drum, March 18, 2009. http://netenergy.theoildrum.com/node/5183. Murphy, David J. “The Energy Return on Investment Threshold.” The Oil Drum, November 25, 2011. http://www.theoildrum.com/node/8625. Murphy, David J, and Charles A. S. Hall. “Year in review—EROI or Energy Return on (energy) Invested.” Annals of the New York Academy of Sciences 1185, no. 1 (January 1, 2010): 102–118. doi:10.1111/j.1749-6632.2009.05282.x. Murphy, David J., Charles A. S. Hall, and Bobby Powers. “New Perspectives on the Energy Return on (energy) Investment (EROI) of Corn Ethanol.” Environment, Development and Sustainability 13, no. 1 (July 11, 2010): 179–202. doi:10.1007/s10668-010-9255-7. Murphy, David J., Charles A.S. Hall, Michael Dale, and Cutler Cleveland. “Order from Chaos: A Preliminary Protocol for Determining the EROI of Fuels.” Sustainability 3, no. 10 (October 17, 2011): 1888–1907. doi:10.3390/su3101888. Patzek, Tad W. “A First-Law Thermodynamic Analysis of the Corn-Ethanol Cycle.” Natural Resources Research 15, no. 4 (February 22, 2007): 255–270. doi:10.1007/s11053-007-9026-9. Pile, Bruce. “The Alternative Energy No One Is Thinking About.” Seeking Alpha, January 13, 2012. http://seekingalpha.com/instablog/152129-bruce-pile/7480-the-alternative-energy-no-one-is-thinking-about. Pimentel, David, and Tad Patzek. “Ethanol Production: Energy and Economic Issues Related to U.S. and Brazilian Sugarcane.” Natural Resources Research 16, no. 3 (August 21, 2007): 235–242. doi:10.1007/s11053-007-9049-2. Rapier, Robert. “Energy Balance For Ethanol Better Than For Gasoline?” Energy Trends Insider, April 8, 2006. http://www.energytrendsinsider.com/2006/04/08/energy-balance-for-ethanol-better-than-for-gasoline/. Show Even Smaller Cane Crush for 2011/2012 Season.” SugarCane.org, November 1, 2011. http://sugarcane.org/media-center/sugarcane-statistics/2011/revised-totals-for-south-central-brazil-sugarcane-harvest2028show-even-smaller-cane-crush-for-2011-2012-season-1. Shapouri, H., J. A. Duffield, M. S. Graboski, and others. “Estimating the Net Energy Balance of Corn Ethanol.” Agricultural Economic Report 721 (July 1995). http://content.imamu.edu.sa/Scholars/it/net/usda_shapouri.pdf. Shapouri, Hosein, James A. Duffield, and Michael Wang. The Energy Balance of Corn Ethanol: An Update. US Department of Agriculture, July 2002. Shapouri, Hosein, and Office of the Chief Economist. 2008 Energy Balance for the Corn-Ethanol Industry, June 2010. http://www.usda.gov/oce/reports/energy/2008Ethanol_June_final.pdf. Shapouri, Hosein, and Michael Salassi. The Economic Feasibility of Ethanol Production from Sugar in the United States. US Department of Agriculture, July 2006. http://www.lsuagcenter.com/NR/rdonlyres/0EF2C03C-1C69-455E-AB51-C16D165C2F41/28608/EthanolSugarFeasibilityReport3Julyreleasedcopy.pdf. “Transformity.” Wikipedia, the Free Encyclopedia, January 4, 2013. https://en.wikipedia.org/w/index.php?title=Transformity&oldid=526496028. Weißbach, D., G. Ruprecht, A. Huke, K. Czerski, S. Gottlieb, and A. Hussein. “Energy Intensities, EROIs (energy Returned on Invested), and Energy Payback Times of Electricity Generating Power Plants.” Energy 52 (April 1, 2013): 210–221. doi:10.1016/j.energy.2013.01.029. Weißbach et al. 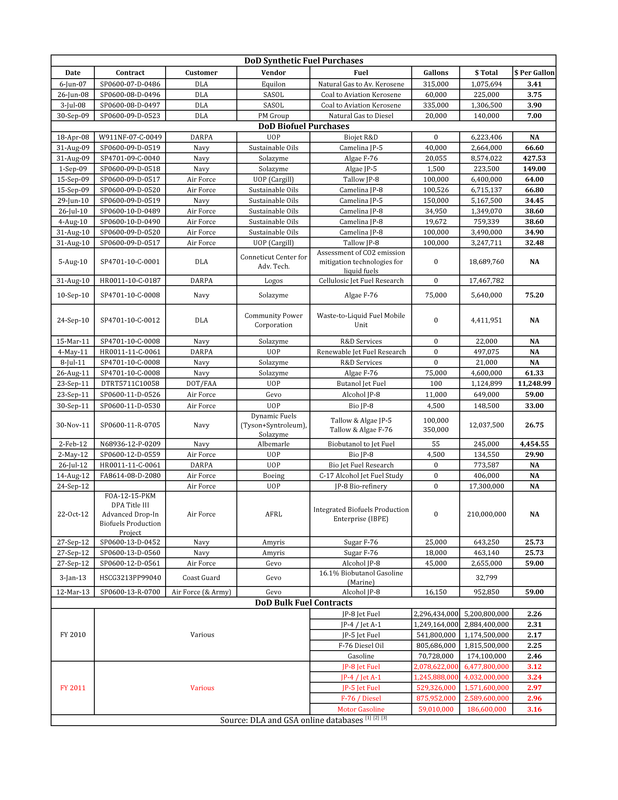 “ERoEI_details.” Accessed May 4, 2013. https://docs.google.com/spreadsheet/ccc?key=0Aux2QwQckeWEdE9UbHNKR3l6THItNi1RTUdxa1RrdUE#gid=0. 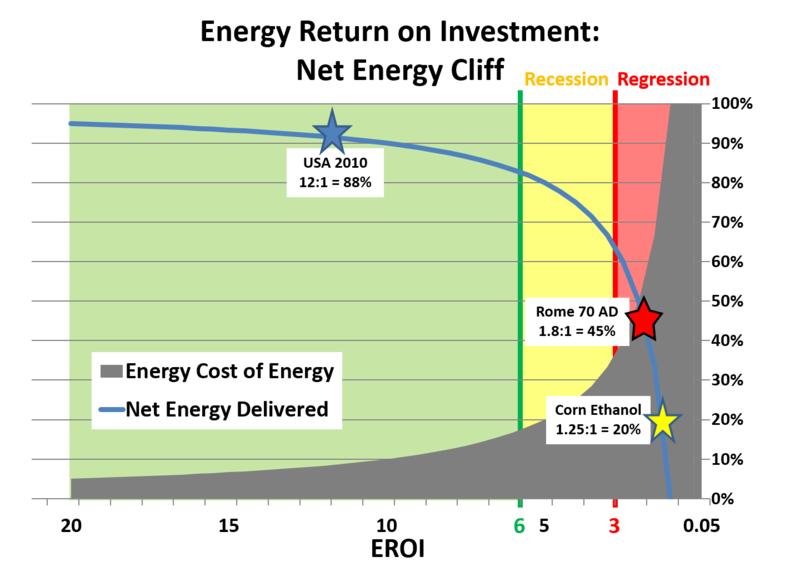 Below is a more detailed version of the “Net Energy Cliff” chart you introduced above. I developed this version to illustrate why EROIs below 10:1 quickly become an exercise in running up the down escalator, and to illustrate where the EROI of US corn ethanol compares to the EROI at the apex of biomass-fueled civilization – the Roman Empire in 70 AD. In building the Colosseum, the Romans achieved an overall EROI of 1.8:1 with slaves and oxen fed by wheat and alfalfa cultivated on huge and efficient Roman latifundia plantations. This high (by agrarian standards) EROI and scale of agriculture were not duplicated for 1,700 years until the discovery of coal and the advent of steam power. The Roman yield per acre in wheat of 1035 lb/acre (1,160 kg/ha) was not surpassed in the USA until the 1940s when widespread use of ammonia fertilizers began. The catch-22 of biofuels is that, to increase the yields to make them economically harvestable decreases their EROIs. Without modern intensive cultivation practices, the Romans achieved 12:1 with wheat and 27:1 with alfalfa, but got about 1/3rd to 1/6th the yield per acre that we do today. Corn ethanol, at nearly 500 gal/acre-yr, is the highest yield biofuel in the USA precisely because it is cultivated with huge amounts of anhydrous ammonia fertilizer made from fossil fuel natural gas. We currently get a mere 1.25:1 EROI for corn ethanol energy, and it is actually break-even at 1:1 for the ethanol itself if the energy credit for DDGS is excluded. The US military’s foray into biofuels has been forced by its political leadership and has not served the US taxpayer well. It additionally has proved harmful rather than helpful to the national security objectives of energy security and global stability. For a detailed look at liquid biofuels and how they have not served US national security interests, see http://www.au.af.mil/au/ssq/digital/pdf/spring_13/kiefer.pdf. As a teaser, here is a chart of all the military biofuel and synthetic fuel purchases made to date since 2007 compared to peak costs for bulk conventional petroleum fuel. The average cost per gallon of the 1.4 million gallons of biofuel purchased by the US military has been $48 and the most recent purchases have been at $59 per gallon. As Bruce Dale indicated in his article above, price is a valid metric. But what price reveals is even more telling. Bioethanol and biodiesel, even after 8 years of more than $6 billion a year in crop program subsidies and RFS tax credits and blending mandates, are still more expensive per joule of energy than petroleum gasoline and diesel. As of October 2013, the DoE reported that, on an equivalent energy basis, ethanol was 85 cent/gal more than gasoline and biodiesel was 61 cent/gal more than petroleum diesel (http://www.afdc.energy.gov/uploads/publication/alternative_fuel_price_report_oct_2013.pdf). If one plots the price of corn ethanol or biodiesel against the price of gasoline, it reveals that biofuels mirror the volatility but maintain their price disadvantage. Besides being somewhat fungible market commodities, what this reveals is the hidden dependence of biofuels on fossil fuels. Corn ethanol is only about 20% photosynthesis energy, with the 80% balance of its energy mostly stolen from petroleum and natural gas and coal and nuclear electric power. Cultivated biofuels are also dependent on non-renewable minerals such as phosphate (13% imported) and potash (75% imported) that would put both our food supply and fuel supply more at risk of a mineral embargo than we are of an oil embargo. The truly “renewable” portion of intensively cultivated liquid biofuels is a minority fraction. Neither our food supply nor our biofuels supply will survive the demise of fossil fuels. If congress today enacted the very sensible policy of prohibiting biofuel producers from using non-renewable fossil fuel in the production of anything labeled “renewable,” the whole industry would dry up, regardless of the subsidy levels. The Israelites couldn’t make bricks without straw, and ADM and POET and Abengoa and Cargill cannot make corn ethanol without natural gas for fertilizer and processing plant energy. It is also telling that they are not powering their tractors with ethanol or biodiesel. And the recent spike in propane prices during in cold snap in the northeast was precipitated by shortages due to Midwest corn farmers using record amounts of propane to dry their corn in the silos after harvesting it wet to avoid an early frost. Liquid biofuels are a dead end as an energy source because thermodynamics and photosynthesis impose limits that prevent simultaneously achieving the necessary annual yield per acre to supply any meaningful fraction of national demand and the threshold EROI needed to support a modern civilization. Thank you for your input on my initial proposed set of metrics. There was actually quite a lot of agreement about these metrics, which is gratifying. I have taken your input and developed a revised set of metrics which follow. I continue to invite your comments, but I may decide not to put forward a third revised set. We will see. I hope these metrics will have a positive impact somewhere, sometime. Humankind currently uses about 450 exajoules (EJ) of energy per year and will require even more energy in the future. Petroleum provides about one third of global primary energy. As a starting point for discussion, let us require that any petroleum alternative be capable of providing roughly 10% of that currently provided by petroleum, or 15 EJ/year, if we are to take it seriously. It seems highly unlikely that future transportation fuels will ever be as inexpensive as the fuels provided by oil at $20 per barrel. However, we cannot pay an unlimited amount for transportation fuels either. As a starting point for discussion, let us require that any oil replacement at technological maturity be capable of providing fuels at a cost equivalent to oil at about $150 per barrel. This figure is a bit more than the current cost of a marginal barrel of oil from tight shale formations (approximately $120) but is likely to be achieved within a decade or so. Many decades and trillions of dollars will be required to make the transition to petroleum alternatives. Thus lower capital cost systems providing the same energy output are obviously very highly favored as they will require less current wealth (foregone current consumption) invested to ensure future access to energy. It is important to identify alternatives to petroleum with the greatest chance of more rapid adoption. Systems that use or leverage existing capital assets for raw material production, fuel processing, distribution and final use are therefore advantaged. Society functions on the surplus energy (called “net energy”) provided by its fuel system that is in excess of the energy required to build, maintain and operate the fuel system. This simple physical fact is often expressed as a ratio called the “energy return on energy invested” or EROI. EROI is equal to the energy provided to society by the fuel production system divided by the energy input from society required to build, operate and maintain the fuel production system. Correcting for energy quality, a minimum EROI ought to be no less than 3:1, and should have clear potential to improve with time. It will be difficult to obtain sufficient societal consensus to build out replacements for oil unless these replacements significantly reduce GHGs. Since oil alternatives will be replacing marginal oil, we could require that the life cycle GHG emissions of petroleum alternatives reduce by one half the GHG emissions of the marginal barrel of oil, using a strict “apples to apples” comparison. There seem to be four primary aspects of sustainability with regard to petroleum alternatives: economic viability (discussed above), environmental impacts, social impacts and renewability. I believe renewability is the key sustainability criterion. The next energy systems we put in place should, in principle, last indefinitely, not just the century or two that oil was able to serve humankind’s needs. Renewability is relatively easy to gauge whereas environmental and social impacts are less easy to gauge (eg, water use and water quality effects, biodiversity, land use, job creation, etc.) and will probably differ for different fuels, different stakeholders and different situations. I have a request and couple of comments. My request is this. Can you produce the graph in your opening post but stated in total dollar expenditure for each fuel for each year? I would argue that still the number one environmental impact of fuel is traditional air pollution. Somehow in the debate over climate change, everyone overlooks air pollution. I am not sure why. Particularly with the volley of publications connecting air pollution to anything from the rise of autism to reduction in child birth weight, and of course respiratory illness and cancer. Yes, there has been big steps forward in emission reduction but to me criteria pollution has to be part of your metric. I think that another criteria should be feedstock diversity. Electricity is a diverse feedstock energy source which enabled low cost coal to undercut oil in the 1970ies and lately natural gas to undercut the price of coal. In fuels we are talking about expensive oil replacing cheap oil, that is not diversity. And of course, we already have fuels that are better from the price point of view, from the pollution point of view and have diversity of feedstocks. Those are alcohol fuels. And I am not just talking about corn ethanol. I am talking about alcohol fuels made from natural gas, municipal waste, biomass, basically anything that has carbon in it. I am afraid I don’t have the information needed to make that conversion for total dollars for each fuel by year, but I can give you some rough numbers. Per GJ, oil has historically cost about 2-3x more than natural gas and about 3-4x more than coal. In the last decade or so, however, these numbers have diverged and oil is now 4-5x both coal and natural gas. Hope this helps. I think there are a lot of problems and costs with oil use, most of them not accounted for in our classical economics.